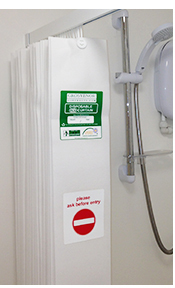 Grosvenor Contracts’ best selling range of disposable shower curtains are available in nine colours. They can be can be quickly and easily fitted to ALL existing tracking systems with minimum disruption, maximum efficiency and no costly adaptations. find your code and make an order. Email info@grosvenorcontracts.com or use our contact form here » We guarantee to challenge your current supplier.